POWERGRID is one of the Central Transmission Utility of India and a “Navratna” Public Sector company under Government of India. This organization is involved in power transmission business with the command for planning, co-ordination, regulation and control over complete inter-State transmission system and operation of National & Regional Power Grids. POWERGRID is one of the organization which operates around 1,26,965Circuit Kms of transmission lines. They have total 205 Sub-stations and wheels about 55% of total power generated in the country through its transmission networks. POWERGRID also operates around 33,240Kms of telecom network. Power Grid corporation issued an official notification in which they are inviting all Indian candidates to apply for various job profile which we explained below. So those who are looking for Government jobs under Power grid corporation can apply for this Power grid recruitment process. What are the various eligibility Criteria for applying this PGCIL Recruitment? Those who have B.E/B.Tech/B.Sc (Engg) in Electrical stream with 65% marks can also apply. Upper age limit is 27 years for Gen. category candidates.30 years for OBC (NCL) & 32 years for SC. Civil Engineering diploma with 70% marks.(OR)B.E/B. Tech/ B. Sc (Engg.) in Civil Discipline with 65% marks can apply. The upper age limit for Gen / SC / ST is 27 Years. While 30 years for OBC (NCL). 2 years Post Graduate Degree/ Post Graduate Diploma/MBA in Human Resource/Personnel Management/Industrial Relation/ MSW with 55% marks can apply. What is the application Fee for applying this Recruitment process? Paying Method: Candidates can choose the online process for the payment of the application fee. The various method for paying the application fee are “ Debit card, Credit card & Net Banking”. You can choose one of these method for the payment of the application. What is the process for Applying this POWERGRID Recruitment? Those who are willing to apply these fresher jobs under Powergrid department can apply online through the official website only. 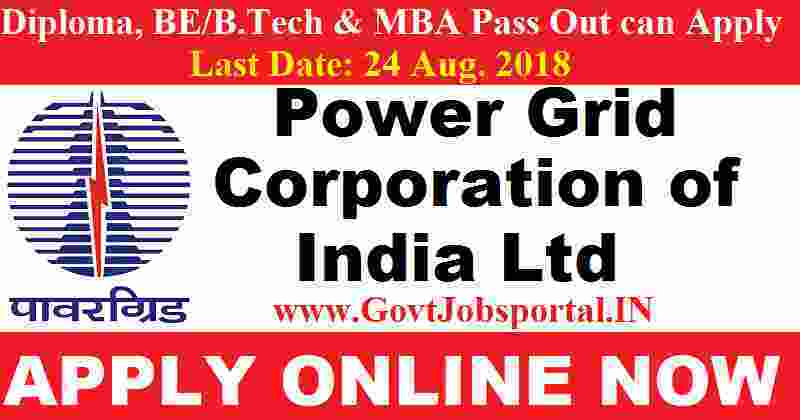 The link for applying online for this POWERGRID Recruitment will be activated on 10th Aug. 2018. This link will remain activated up to 24th Aug. 2018. Candidates have to apply online between these dates. Check IMPORTANT LINK Section at the last of this post for more information. 10TH Aug. 2018 is the Starting Date to apply. 24th Aug. 2018 is the Last Date for applying.